Have you ever asked yourself how stress-resilient you are? What are the things you do when the pressure rises? Do you nail bite, over-eat or –drink, become anxious or irritable? And do you spot the signs early enough to take action and avert the symptoms that herald more serious stuff ahead? Stress related illness costs the UK economy £14 bn a year in sick leave. An inability to handle the mounting pressures of modern-day living can seriously affect your immune system and mental health. Teenage stress is also on the rise and many use self-harming as a way of relieving stress. We all need to stay informed about the many faces of stress-related symptoms. Join me and hear what my colleague, stress expert Emily Gajewski, has to say about self-harming and how to deal with it. Drawing on a wide range of tried and tested approaches to improving mental health and well-being, including cognitive behaviour therapy, hypnotherapy, mindfulness, compassion-focused therapy and much more, this book makes the links between the science of the mind and how to feel better – physically, emotionally and mentally. 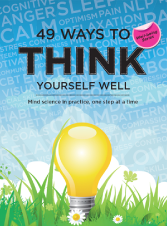 49 Ways to Think Yourself Well offers readers a compilation of insightful information and activities for improving well-being. Beautifully illustrated, it offers evidence based guidelines and a host of practical ways for boosting well-being on all levels, using the tools within our minds.